General Characteristics: Medium in height, slender, erect, maturing within 7 to 12 months, producing two or three branches; distinguished by pinkish-rose color of petioles. Petiole: 50 to 85 cm. long, pink when young, changing to yellow-green except near base, with narrow, indistinct, light pinkish edge. Leaf blade: 30 to 50 cm. long, 20 to 30 cm. wide, 20 to 40 cm. from tip to base of sinus, sagittate, vertical, firm-chartaceous, dark green or with bluish cast; piko pink or yellowish, the color extending into the main veins of the lobes; lobes acute with deep sinus. Corm: Flesh yellow with light yellowish fibers; skin yellow. 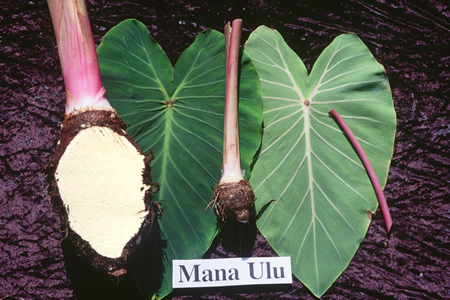 Origin, and derivation of name: Native variety; called Ulu because of the resemblance of the flesh of the corm to the poi made from breadfruit. 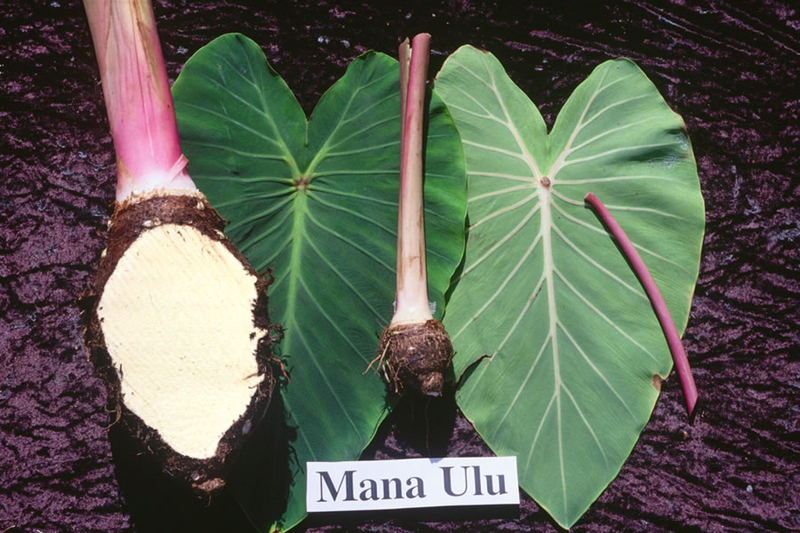 Distribution: Found extensively under upland culture in Kona, Puna, and Kau, Hawaii; does well under wetland culture on Kauai. Remarks: The orange-yellow flesh of the cooked taro is much more attractive than that of most varieties.